St John’s gospel tells the story of Mary standing under the cross, witnessing her son’s torment and death. 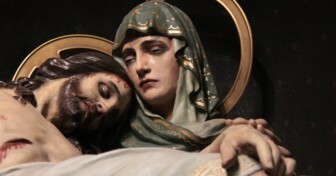 It’s an image that has inspired the Stabat Mater, a 13th century hymn which has been set to music by many composers. But how many Christians really pause to think what it must have meant for a mother to know that her innocent son had been condemned to death, and then to witness his torture and execution? Our Good Friday edition brings this story right into the 21st century, with a present-day mother who has had to endure the knowledge that her son was in danger of execution, and then had to learn to live with his very public and brutal killing. She is Diane Foley, whose son, US journalist James Foley, was beheaded by Islamic State in Syria in August 2014. Talking to Mark Dowd, Diane reflects on why, even though she never spoke to Jim again after his capture, she knew her son was close to her in prayer. She explains how the experience has helped her understand Mary far more deeply, and why she has been able to forgive “Jihadi John”, her son’s unrepentant killer. And she reveals why, despite her strong Catholic faith, reports that James converted to Islam in captivity never worried her. Our special thanks go to Coro, the London-based chamber choir, and its musical director Mark Griffiths for their kind permission to use their performance of Scarlatti’s Stabat Mater, which was recorded at Christ Church Chelsea on 28th March 2015. To find out more about Coro visit their website here. To find out more about the James W Foley Legacy Foundation, please visit their website here. This podcast won the Interview of the Year category in the Sandford St Martin Awards 2016, and a Jerusalem Award in the Good Friday Digital category in October 2015. Congratulations to all who have come together to create the interview. I was inspired by the perspective Diane has shared and her unrelenting resolve to dwell on light(ness. I also appreciate Mark’s courage to walk the tight rope of tapping on excrutiating pain. Still, I was hoping for more indepth and diverse angles to be travelled to get a chance for greater insight and sense of relief to emerge. lovely piece with diane foley mark..thanks for intro to things unseen. A beautiful and seminal piece that clearly expounds and celebrates the love and compassion of a mother, and of what is true faith. Would that I could be like Diane Foley. Good work Mark Dowd!